Police in Australia hopped to the aid of a drowning kangaroo on Saturday. Resident Mia Grant filmed video of the animal struggling amid the ocean waves before police arrived. Sgts. 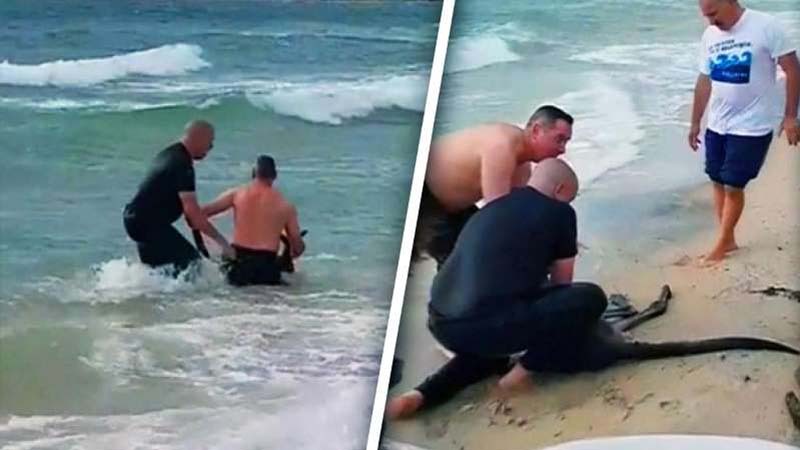 Christopher Russo and Kirby Tonkin didn't hesitate to wade into the sea to rescue the kangaroo. "Every life is worth saving and we just did what we could," said Tonkin, according to the BBC. By the time they got to it, they said the animal was unconscious and had gone under the water, so the officers had to act quickly. "I grabbed his tail and Kirby cradled his head and dragged him onto the beach and cleared his lungs to get the water out of him," Russo said. "Then we just started to push on his chest and he started breathing again and I could feel a heartbeat." The kangaroo was later taken in by local Animalia Wildlife Shelter to recover.